St Francis Solanus was born in Montilla, Spain. He attended a Jesuit school and, drawn to a life of poverty and penance, joined a Franciscan Friary at the age of 20. In addition to their usual daily routines of prayer, silence and fasting, St Francis also abstained from meat, went barefoot and wore a hair-shirt which induced discomfort and pain. In 1576, St Francis was ordained a Priest and subsequently appointed Master of Ceremonies and itinerant preacher. St Francis hoped to become a foreign missionary worker but his initial request was refused. Instead, he was appointed Master of Novices while serving the poor and sick during an outbreak of plague which he succumbed to but survived. In 1589. 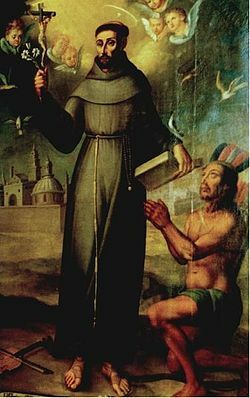 St Francis’ missionary dream was granted when he was sent to North West Argentine and Paraguay, remaining there for the next 22 years. His work was a tremendous success. As a gifted linguist, he used his skill to quickly acquire local languages, integrate with the people and teach Jesus’ Gospel, evangelising many. It is said that he predicted the devastating 1618 Peru earthquake and his own death. St Francis is often referred to as Wonder Worker of the New World. St Francis’ Feast Day is the 14th July. He is the Patron Saint of earthquake prevention and multiple South American countries: Argentina, Bolivia, Chile, Paraguay and Peru. Pray for us that our passion for spreading Jesus’ Gospel to others will remain a cornerstone of our lives.